The audio for this blog post can be found at my audio blog Musings of KarlettaA and here. This is a talk I wrote in one of my good weeks while experiencing Autistic Burn Out. Using this method as a baseline has helped me on my recovery journey with depression and anxiety. You can read my blog post called “Learnings of a former youth advocate: public speaking” here. I am available for public speaking and leading workshops in Brisbane. 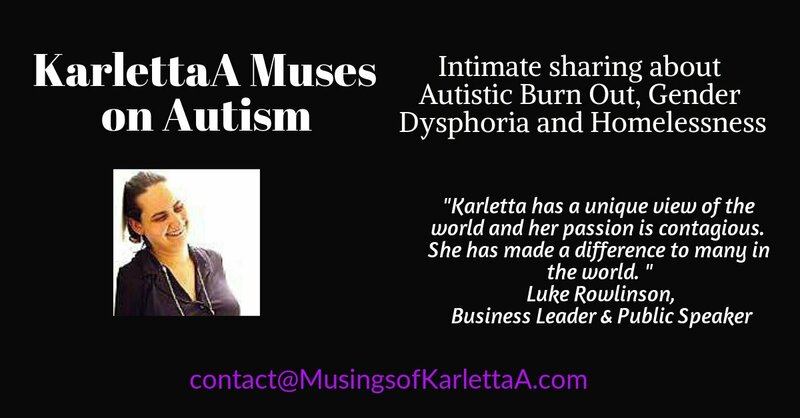 Available for Autism Acceptance / Awareness month. My name is Karletta Abianac, and I live in Brisbane. I live in my own rental unit and I love being surrounded by nature and the peaceful streets. I’m really happy to be here today, talking with you. Its been years since I’ve done public speaking, and I’m really glad to be back on stage again! In my youth I used to volunteer and do public speaking about disadvantaged youth, then became a seminar leader for a personal development company. I had to stop public speaking and working in 2006, when my depression and anxiety became too intense to manage. I wrote a memoir about the experience called Successful to Burnt Out. I have five self published books now, and after years of practice, am happy to call myself a writer. Talking to you, is a sign that i’m over the worst of my burn out. So I’m really glad to be here, sharing some helpful stuff about how I’ve been achieving my goals. I’m going to be talking today about how to recognise unrealistic goals, and create ones that you’re comfortable with. I asked you to come along today with a goal in mind. Or maybe you have an unwanted habit that you are trying to break? Who here has got a goal that feels like its a good idea and you SHOULD do it? Please raise your hands. Keep your hand up if they are the same goal. The three things I will be talking about are goals realistic to you, and being willing to fail, and practicing. If you find yourself practicing new habits some or all of the time – on a regular basis, then give yourself a pat on the back. In fact, why don’t you acknowledge and celebrate your efforts for the rest of the day. Today is your day to celebrate your efforts and your commitment. You are not starting from scratch at this speech. You are building on the experiences of your previous goals. You will hopefully find today really helpful for a few reasons. One – you will see some pitfalls that we can get into – traps that take you away from practicing and achieving your goals. The second reason is you may learn things that help you be successful this time around at practicing your goals. Thirdly, I hope that you will feel comfortable about updating your current goals. If you just can not motivate yourself to change a habit or behaviour, today could be a special day for you too. I’ll talk about some reasons why we fail to achieve our goals. Chances are, you’ll realise why you stopped practicing. If you have executive function challenges, Attention deficit disorder and other health challenges – this is NOT going to radically alter your life. But it will help you recognise unrealistic goals for you. To start off with, Expectations kill off our desire and motivation to keep practicing new habits. I hear that we live in a world of instant gratification. I know I certainly feel this. This includes having unrealistic expectations – for instance, if you are working on changing a habit, what may be realistic for you is to stop yourself from doing an old behaviour once or twice a week. Or if you want to start exercising, what might be realistic for you is to just spend time stretching every few days. One way that I started to get fitter a few years ago was to just do stretching in bed every few days. Then I moved to excersizes in a chair, then walking around my veranda and doing gymnastics warm-ups. Later I started walking around my back yard. For people who’ve spent years practicing giving up unwanted habits, it still often takes them months to change a habit for good. For myself, I typically spent a week just observing myself – noticing when I was doing a bad habit. Then I would spend a fortnight being willing to fail at stopping myself from doing that habit. Then the next few months would be spent practicing not only stopping myself, but also replacing the bad habit regularily. Or with a goal, working on an outcome regularily. For myself right now, I am to write for 10 minutes a day. That is far more realistic, and feels more comfortable than my old goal of writing 1,000 words a day. We tend to think that once we commit to changing a bad habit, we should be able to stop doing it every time. It really doesn’t work that way. Letting go of a bad habit involves a lot of practice and a lot of failed attempts. You can cut yourself some slack. You really are allowed to. When assessing your goals and revising them, don’t give up exploring and practicing ideas you have. Something that didn’t work months ago might work today, because you are in a different frame of mind. There are also things that you’ve learnt over the past few months that you don’t realise you’ve learnt until you give it another go. You can not know whether something will work until you try it. Well, I think thats too strong a statement. Sometimes we have a pretty good idea that we can’t do something. Maybe we are constantly forcing ourselves to do something. Just revise your goal – how realistic is it for you, right now? There are a few stages to achieving a goal and changing bad habits that work for me. What are your expectations? Do you think you should stop unproductive habits in a matter of weeks? Do you think you need to achieve a goal next week? Can you take the pressure off and have it done within a few months instead? How realistic does your goal feel to you? Not how realistic do you think it is for a person, the neighbour, the person sitting next to you. How realistic do you feel it is for you, right now, at this stage in your life? Being someone with depression or anxiety, you could give yourself a week or two to notice and just observe yourself doing an unwanted habit. Practice mindfulness by separating yourself from your expectations. Wouldn’t that take the pressure off you to get it right all the time? You are going to have days when you are on fire and do heaps. Just let them happen naturally, and get on with doing what you can in the meantime. Manage your expectations when you think this SHOULD be the new normal. * Write down something that you’re ok with noticing, practicing, and failing. Is your environment toxic? Maybe there are people around you that you’d really rather not want to be friends with. Is your environment aligned with your goal? Try having an ample supply of cleaning products, putting your medication in a week long pill boxes, having a favourite scented soap and shampoos. What written structures do you have for recording your practicing, and your fails and successes? By default, we usually easily remember the failures, and feel there are more than you’ve had. I’ve been recording some of my failures and success over the years. Some journal entries, budgets, notes, daily schedules and to do lists. I’ve found it invaluable to look back on them months and years later. I can see unrealistic expectations and short term goals that should have been allotted more time. If you’ve got them somewhere, bring out your old budgets and to do lists. See what you can learn from the past. * Write down what concerns could you get rid of that free you up to practice or achieve your goal? Try practicing and failing, instead of expecting perfection and failing. We practice to build the mental muscles to be able to do it on command. You don’t need a big outcome in mind when you’re practicing. I’ve found it more effective to practice just for the enjoyment and sake of practicing. Try to take a step forward, and hope your little achievements help in the long term. Be willing to fail. Failing is simply ‘not doing what you set out to do’. Practicing assumes you will fail many times until you have mastered something. These little achievements can be tines when you practice mindfullness – paying attention to what you are doing, as you are doing it. Once again, at this stage, sometimes you will be free to take lots of actions, and sometimes you wont be. Even after you’ve had a great couple of weeks, or done a task a few times in a row, sometimes we stop for a while. Thats part of practicing and building your mental habit muscles. * Write down how many weeks you can give yourself for observing yourself when you try a goal, and how many weeks you will practice your updated goal or habit. Please take a couple of minutes to update your goals. Remember to give yourself time to practice and fail, and to be as realistic as possible.